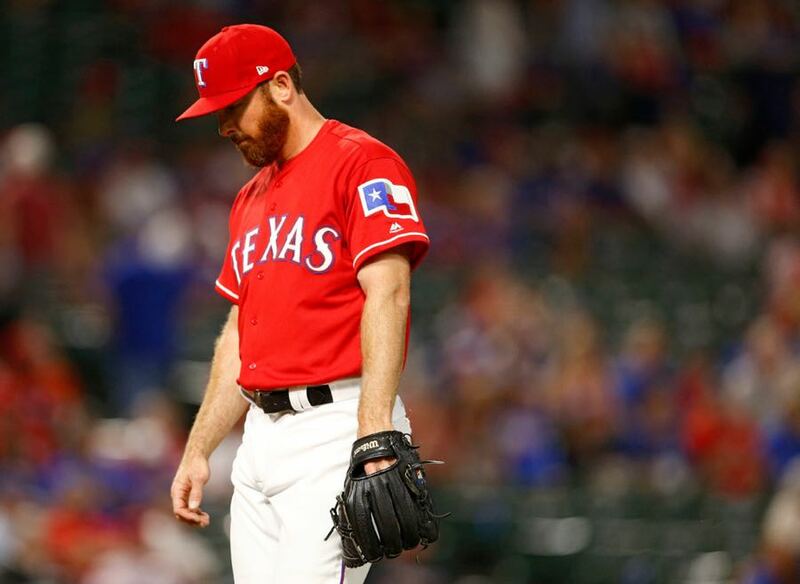 ARLINGTON -- Rangers closer Sam Dyson had a rough opening night, allowing three runs without finishing the ninth inning of an 8-5 loss to defending American League champion Cleveland on Monday night at Globe Life Park. Andrew Miller, Cleveland's lights-out left-handed reliever, came to the defense of his Team USA World Baseball Classic teammate. "Dyson was as good a pitcher as we had," said Miller, who overpowered the Rangers in a scoreless eighth inning. "He gave up a couple of hits, but he's going to be fine. At the end of the year, his numbers will be there. There's no doubt in mind." One game does not a season make, Miller said. He acknowledged Dyson will be tested by starting out in this manner. "It's tough dealing with psychologically, because you want to get off on the right foot," Miller said. "But you can't get too high or too low on one game." This was a bullpen mismatch. Rangers relievers gave up four runs in 22/3 innings behind starter Yu Darvish. Matt Bush lost a 5-4 lead on Edwin Encarnacion's homer in the eighth on a curveball. This was Encarnacion's debut with the Indians. "That's why we got him," Cleveland manager Terry Francona said. "It's a nice feeling. You can tell he had one thing on his mind there, and he did it." Cleveland starter Corey Kluber of Coppell overcame a slow start to get the game to the bullpen for the start of the seventh. That is how the Indians made it all the way to Game 7 of the World Series last season. Four Cleveland relievers shut out the Rangers for three innings. It looked much like last season, when the Indians bullpen had the AL's second-lowest ERA at 3.41. It was lower than that for the final two months, after the club added Miller for the final two months. There is a carryover of confidence for the Indians, based on that showing. "Most bullpens are like that now," Francona said. "You start getting to the back of the bullpen, there's not too many teams that don't feel good. There are a lot of good arms in this league. "I hope that we're one of them. There's a résumé there with all these guys." The Indians matched their biggest comeback of last season by rallying from a 5-1 deficit in the third inning. Cleveland had 38 comeback victories last season. Encarnacion's trot revived bad memories for the Rangers. They selected him in the ninth round of the 2000 draft but sent him to Cincinnati a year later as part of a deal for right-hander Rob Bell. It turned into a terrible deal. Bell was 9-8 with a 6.73 ERA in two seasons with the Rangers. Encarnacion, who joined the Indians as a free agent in the offseason, has 311 career homers and three All-Star appearances. He essentially fell into Cleveland's lap during the offseason. "I'm going to really, really enjoy him for 162 games," Miller said. Like Darvish, Dyson could not handle Abraham Almonte, the No. 9 hitter. Almonte, playing because starting right fielder Lonnie Chisenhall has an injured right shoulder, was a pest. He walked twice against Darvish, coming back from 0-2 and 1-2 counts, and scored once. Almonte struck out against Darvish in the seventh, but reached on a wild pitch as a run scored. Almonte faced Dyson with Tyler Naquin, of Texas A&M, at second and one out. Almonte drove in the go-ahead run by lining a changeup up the middle. "I was just trying to make sure I put a good swing on a strike," Almonte said. CLEVELAND, Ohio -- The Cleveland Indians take on the Texas Rangers in the 2017 season opener for both clubs at Globe Life Field in Arlington. Get scoring updates and participate in a live chat below. Broadcast info: SportsTime Ohio, ESPN, WTAM 1100, WMMS 100.7 FM, Indians Radio Network. Pitching matchup: RHP Corey Kluber (0-0, 0.00 ERA) vs. RHP Yu Darvish (0-0, 0.00). Fact du jour: This is the first MLB Opening Day start for Yu Darvish, who started five Japanese openers for the Nippon Ham Fighters. The Rangers are starting their ninth different Opening Day pitcher in nine years. ARLINGTON, Texas -- Singing comes easily for Texas Rangers third base coach Tony Beasley, which is part of the reason he handled the national anthem on Opening Day against the defending AL champion Cleveland Indians. The bigger explanation was Beasley's return to full-time duties in his home ballpark Monday for the first time in more than a year. The 50-year-old missed last season while getting treatment for rectal cancer that was diagnosed before spring training in 2016. A year ago, Beasley was away from the team, in the middle of an aggressive cycle of chemotherapy. Before this opener, the short, stocky former minor league infielder carried a couple of boxes of balls and a bat through the clubhouse, stopping for reporters before resuming his pregame routine. "I'll never forget last year and what I had to endure, all the lessons that were learned that came with that," said Beasley, who sang the anthem in Pittsburgh when he was on the Pirates' staff in 2010. "Last year will always be a part of me." Beasley's 85-second rendition went off without a hitch, unless you count close friend and Texas manager Jeff Banister's warning two days earlier about coordinating with the flyover. Turns out Beasley finished almost 15 seconds early. "Told him just don't mess up the timing," Banister said, "because if they fly over too soon or too late, nobody will remember." These two won't forget anything about the past year. Banister, who survived bone cancer in his leg as a teenager, was the "bad guy" during Beasley's battle, figuring his role was to make sure Beasley made it through the difficult days. But Beasley didn't plan on having any bad days. That's the mindset that inspired teammates and fellow coaches. And in Beasley's mind, that's why he was declared cancer-free in December, shortly after his final surgery on his 50th birthday. "I didn't allow myself to deal with tough days. I refused tough days," Beasley said. "No matter what I had to go through that day, I felt like I'd get through it and keep moving. I understand that it was a process, but it was a process that I had to win day in and day out." Banister and Beasley grew close as minor league teammates in the early 1990s and served on the Pirates' staff together before the Rangers hired Banister after the 2015 season. He brought Beasley with him. "Tony's probably the closest person I have in the game," Banister said. "We have shared joy, heartache and have celebrated a number of things together. We can talk about other things other than baseball. I like to think we do life together as much as we do baseball together." Beasley prefers gospel music and sings in his church. Clubhouse leader Adrian Beltre declared him the "happy birthday" singer, so the players weren't hearing him for the first time. "I think hopefully they chose him to [be on] one of the shows on TV because it's really good," shortstop Elvis Andrus said. The reviews were beside the point, though. "Just to be back doing things that I enjoy doing, at full capacity without limitations, I'm thankful and honored," Beasley said. "My health is back." And Beasley celebrated with a song in front of nearly 50,000 listeners. 0 Response to "Rangers' late loss to Cleveland reveals a bullpen mismatch"